In the spring, female beetles lay eggs in the bark of standing or recently felled trees. Eggs are usually laid singly, but sometimes in clusters of up to ten eggs. Larvae hatch 10 to 14 days later, and bore into the phloem to feed, producing a network of irregular tunnels packed with sawdust-like frass (excrement). After about two months, the larvae are 1.5 to 2.5 cm long. Most T. fuscum overwinter as prepupal larvae either under the bark or in characteristic L-shaped pupal cells about 2-4 cm deep in the sapwood. Pupation occurs in spring and adults emerge about 14 days later, chewing a round or oval exit hole in the bark about 4-6 mm in diameter. The adults live approximately two weeks and can be found from June to August. Both males and females are strong flyers. Over most of the range of spruce in Canada, the BSLB would likely have one generation per year. In its native range BSLB, is recognized mainly as a secondary forest insect, attacking trees that have already been subjected to other types of insect attack or environmental stresses. During a population outbreak, beetles can attack living, healthy trees. Outbreak levels have the potential to persist for a decade and continually cause damage over extensive tracts of vulnerable conifer forest. In Europe, T. fuscum often attacks stands of Norway spruce over 50 years of age. Tunnels in the wood as a result of larval feeding reduce timber quality. tunnels in the wood about 4 cm deep and 6 mm wide. These tunnels appear L-shaped when the wood is cut longitudinally. Coarse sawdust may be found in and around tunnels or plugging the exit hole. If the beetle is not found, the presence of Ophiostoma tetropii is an indication that the infected bole has been colonised by the BSLB. More: The adult has a flattened body, 1 to 1.5 cm long.The head and neck area are dark brown to black. The elytra (wing covers) can be tan, brown or reddish brown and have 2 to 3 longitudinal stripes. The antennae are red-brown and about half of the body length. The legs are dark brown. The egg measures one mm long, is oblong and white with a tinge of green. The larvae is yellow-white, about 14 to 28 mm long, and slightly flattened. The larva's head is reddish and about half of the body The head is reddish brown and about 3 mm wide. The pupa is white and measures 10 to 17 mm long and 3.8 mm wide. This insect is native to Europe, where it can be found from Scandinavia to Turkey. It is also known from Japan and western Siberia. The find in Nova Scotia is believed to be the first discovery in North America. 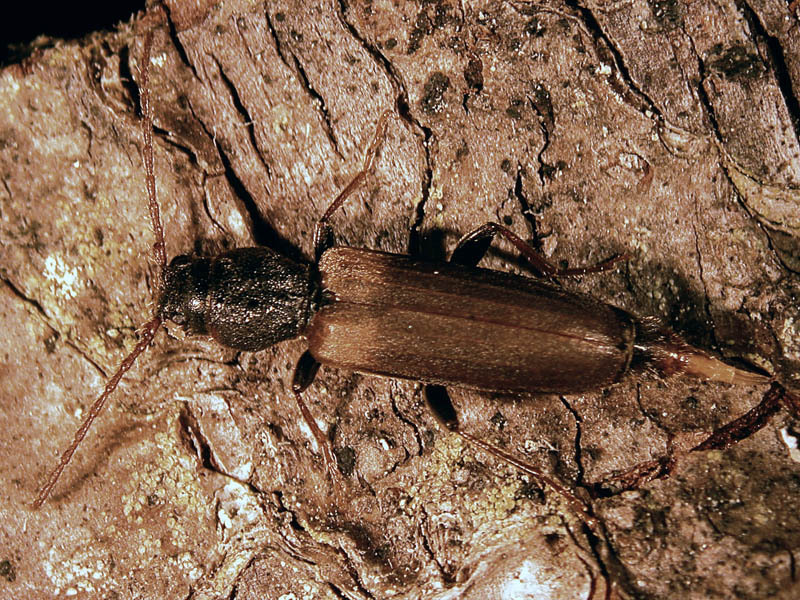 In March, 1999, the brown spruce longhorn beetle (BSLB), Tetropium fuscum was found in dying red spruce trees in Point Pleasant Park, Halifax, Nova Scotia. The following summer, the Canadian Forest Service (CFS) reared over 40 T. fuscum adults from red spruce bolts collected in the park. Subsequent investigations by the CFS concluded that T. fuscum was also attacking apparently healthy trees. Specimens collected in the park in 1990, originally identified as a related native species (Tetropium cinnamopterum) have also now been confirmed as Tetropium fuscum. Some fungi such as O. tetropii or Pesotum fragrans, have been isolated from brown spruce longhorn beetles or from boles infested by this insect. These fungi are not considered as being pathogenic. Flaherty, L.; Sweeney, J.D. ; Pureswaran, D. ;Quiring, D.T. 2011. Influence of host tree condition on the performance of Tetropium fuscum (Coleoptera: Cerambycidae). Environ. Entomol. 40(5):1200–1209. Francke-Grosmann, H. 1954. Feinde und Krankheiten der Sitkafichte auf norddeutschen Standorten. Forst- u. Holzwirt 9:117-119. Jacobs, K .; Seifert , K.A. 2004. Fungi canadenses No 346 - Ophiostoma tetropii. Can. J. Plant Pathol. 26:76-78. Jacobs, K.; Seifert , K.A.2004. Fungi canadenses No 347 - Pesotum Fragrans. Can. J. Plant. Pathol. 26:79-80. Juutinen, P. 1953. 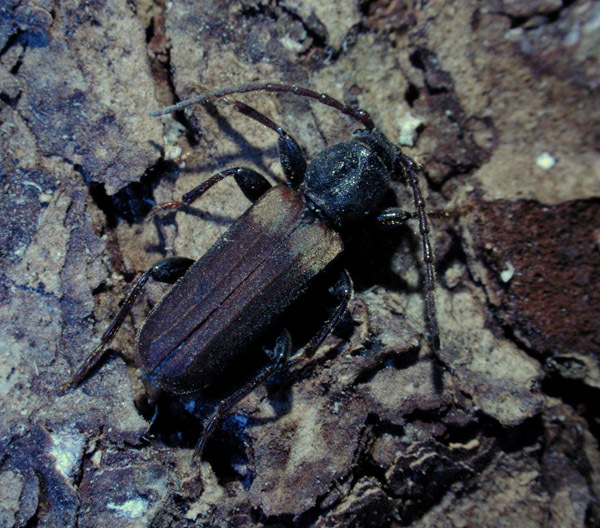 Ukkoniluri (Dendroctonus micans Kug.) (Col., Scolytidae) okakuusessa (Picea pungens Engelm.). (in Finnish with English summary) Ann. Entomol. Fenn. 19:35. Reineck, G. 1919. Die Insekten der Mark Brandenburg. 2. Coleoptera. Cerambycidae. Deutsche Ent. Zschr. Berlin. 92 p.
Schaufuss, C. 1916. Calwer’s Käferbuch. II. Stuttgart. pp. 850-851. Smith, G.A. ; Humble, L.M. 2000. The brown spruce longhorn beetle. Natural Resources Canada, Canadian Forest Service, Pacific Forestry Centre, Exotic Forest Pest Advisory 5, 4p. Troy Kimoto, T.; Duthie-Holt, M.; Dumouchel, L. 2006. Exotic Forest Insect Guidebook. Canadian Food Inspestion Agency, 120 p.
Sweeney, J., Gutowski, J.M., Price, J. and de Groot, P. 2006. Effect of semiochemical release rate, killing agent, and trap design on detection of Tetropium fuscum (F.) and other longhorn beetles (Coleoptera: Cerambycidae). Environ. Entomol. 35: 645-654.